esigner Robin Spurs knows just how "eye-catchingly" conspicuous most of her customers feel and had these customers and their feelings in mind when she created HAT & HAIR™. Many, but not all, of Spurs' customers have no hair due either to treatment for cancer or alopecia (an auto-immune disease that causes hair loss). When asked how she thought of the idea for HAT & HAIR™, Spurs tells of the time when she had her regular hat business and of one customer in particular who first inspired her. Just one year earlier, Spurs had lost her mother to pancreatic cancer, years earlier her grandmother to breast cancer and her sister is now a 15 year cancer survivor. She understood this woman's needs. Still grieving the loss of her mother, Spurs immediately began thinking of how to combine hats with wigs in the most comfortable way possible, with a sort of "all hat-some hair" goal in mind. 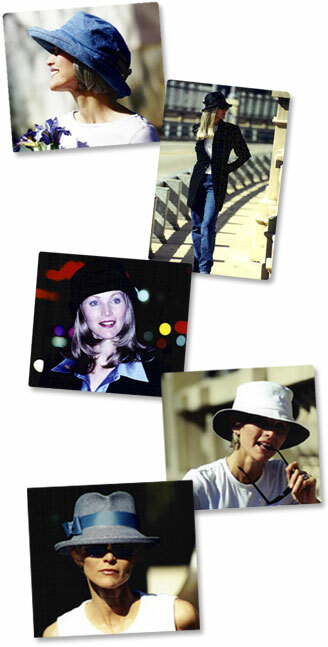 ast forward...HAT & HAIR™; hats with detachable hairpieces and bangs. "I know my Mom would be my biggest supporter of what I am doing now with my love for design. But being able to help alleviate at least some of the anxiety and discomfort for my customers regarding their appearance during a time of hair loss is a true privilege for me. And an even bigger joy to me is when I see my customers actually having fun in the process. This is good!" But, as stated earlier, not all of Spurs' customers are hair loss patients. Because her designs are so mainstream and not what her customers call "cancer patient uniform wear", HAT & HAIR™ is fast becoming a fashion fun item as well. Bad hair days, no hair days, fun hair days, are just three good reasons for the newly forming success of HAT & HAIR™.